Helping a child learn to write is a lot of fun. There are a few things you can do to help your student learn to write. First, make sure you help your child hold their pencil correctly. We have a fun Alligator trick that works well and children love for helping a child hold their pencil correctly. Next, make sure you help the child know where to start forming the letters. We always start the letter at the top and pull down. It is not good enough to let your student practice, practice, practice. Make sure when they are practicing writing that they are practicing writing well. When you write/form a letter correctly, you are able to write faster later (when you are better at writing). Help your child have proper spacing on the paper between letters and words. One fun trick is to have a “spaceman”/wooden ‘Popsicle’ stick to place between words, or a student can use a finger, OR, a cheerio. Soon your student will know how to space words well. You can make handwriting practice fun by giving children colored pencils to write with. Write a rainbow! Drawing is a great way to practice handwriting. Yes, you still have to practice letter formation, but, pencil grip is part of the battle. Make sure you child is holding their pencil correctly and then have them draw! Also, if you have tracing sheets, have your student use a highlighter and trace over the letters. My students always like this. 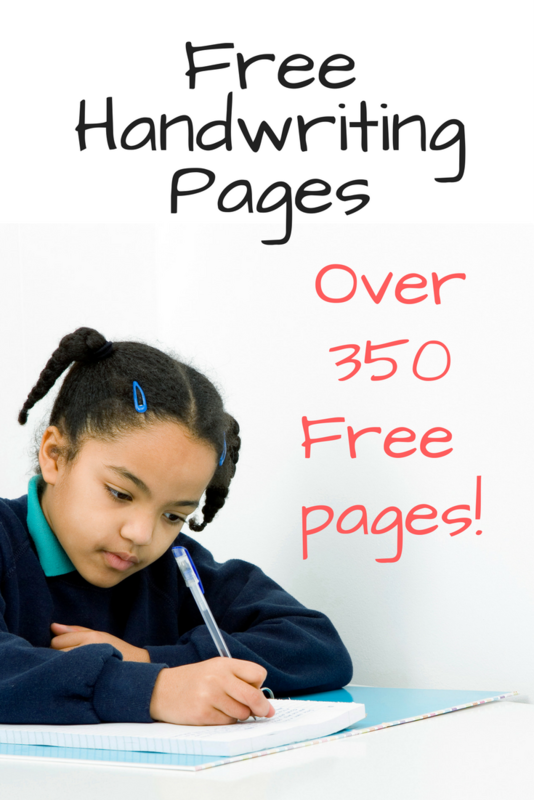 To help you help your students practice writing, I have included some free printable handwriting worksheets below. Hope you find what you need! A great way to start teaching handwriting is to first start teaching the child how to write his/her own name!